Miniature and Mini-Books. Part 1. I love books. Books on all kinds of things; cooking, crafts, fiction, picture books and so many more. I collect a few different types, one I have already mentioned is Retro Craft and Cooking books. Another, is mini-books or miniature books. Most of these books, according to those in know, are less than 3 inches tall. I have a couple in that size range and some that are about 3.8 inches tall. I’m going to feature those books, plus share some interesting links in a series of posts. The first is titled Gardens. It is 3.8 inches tall and was published in 1995. The reason why it is one of my favourite mini-books is due to the gorgeous pop-ups and the tiny envelope with gift card which allows you to sign the book if you give it as a gift. I found my copy at a second-hand book sale and it is one of my favourites. 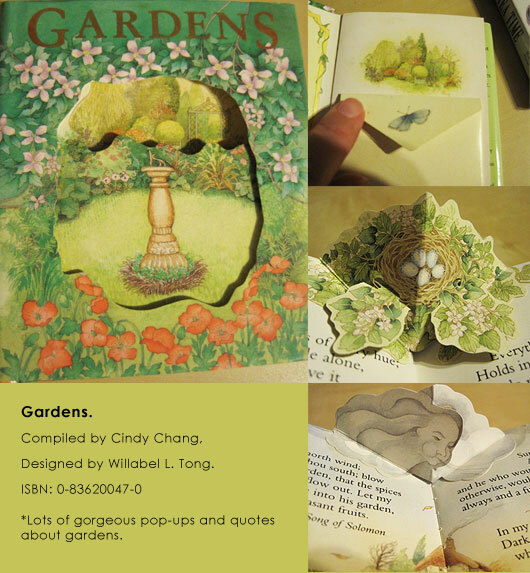 You can see images of this mini-book below. I found some lovely links about miniature and mini-books, and will share them throughout this series. The first batch are below. Enjoy! 4000 Years of Miniature Books. Lovely online exhibit of pictures from a past exhibition at the University of Indiana’s Library. The Miniature Book Library. A gallery of an on-going mail art project of miniature books. Bookmaking for Little Hands. Bookmaking instructions for children with some lovely examples.